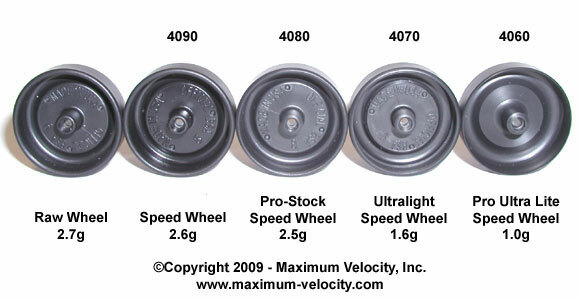 What is the differences in the various pinewood derby wheels you offer? Optional: Speed for Awana (4025) No Optional: Cone hub, polish bore. RA Racer Stock N/A Optional: Cone hub, polish bore. 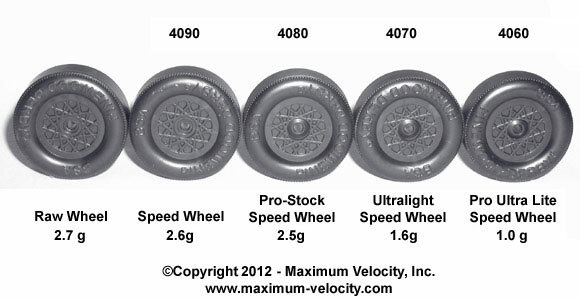 1Typical weight per wheel in grams. 2Can use: BSA Speed Axles, Grooved BSA Speed Axles, Official BSA Speed Axles, Speed Axles, Nickel Speed Axles, or Super Speed Axles. What is the difference between the Speed, Pro-Stock Speed, Ultralight Speed, and Pro Ultra Lite Speed for BSA? Where on your web site can I order these wheels? Click on the links in the first column of the tables above. Where can I find information about the mold numbers for BSA wheels? Round: How close the wheel approaches a true circle. This is irrelevant for lathed “Speed Wheels”. A rating of “Excellent” is given to wheels with less than 3 thousandths total runout. “Good” indicates less than 5 thousandths. Left-Right: How close the sidewall is perpendicular to the wheel hub. A rating of “Excellent” is given to wheels with less than 3 thousandths total runout. All of the BSA wheels have minimal left-right deviation (less than 5 thousandths total runout). Bore Size: The relative diameter of the wheel bore. “Typical” is 96 thousandths. “Large” is 97 thousandths or larger. Within each mold family, there are occasional bad wheels. This is mostly due to the manufacturer not allowing the molded wheels to cool sufficiently before mold removal. Always spin test each wheel, eliminating wheels with excess side-to-side wobble. In the table below, the premium matched wheels are identified with a green background. Measurements were made in June of 2018. Ten wheels from each mold were randomly selected from 1,900 wheels. The wheels were examined and the results averaged. In general, all of the BSA wheels continue to be good, although there were a few changes in ranking. Note that the difference between the Excellent, Good, and Okay ratings is just a few thousandths of an inch. Q: Can I pick a mold number? A: Yes, to reserve and order a particular mold number for Speed Wheels, or Premium Matched Wheels please Click Here. What is the difference between the axles you offer? 4056-Polished BSA Speed 4 Zinc-plated Steel Beveled 0.086 ± 0.0005 No Nail Point None required – already polished. 4035-Polished Rail-Rider BSA Speed 4 Zinc-plated Steel Beveled 0.086 ± 0.0005 No Nail Point None required – already polished. 4036-Slotted Polished Rail-Rider BSA Speed 4 Zinc-plated Steel Beveled 0.086 ± 0.0005 No Nail Point None required – already polished.